1. Our concrete mixing plant uses modularized design. It is easy to install and transfer. 3. Its pneumatic components are of high reliability and safety. 4. Every weighing apparatus uses high precision sensor weighing method to weigh the concrete. 5. The whole concrete mixing process is carried out in a closed situation. Furthermore, our concrete mixing plant is equipped with dust collecting device. The dust discharge and noise level conform to relative standards. So the concrete mixer will not pollute the environment. 6. 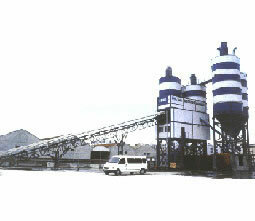 The theoretical production of HZS60 and HZS90 concrete mixing plant is 60m3/h and 90m3/h separately. Overall dimension of these two machines is 20×16.5×19m and the discharge height is 3.8m. 7. For HZS120 and HZS180 concrete mixing plant, the theoretical production is 120m3/h and 180m3/h separately. Their discharge height is 3.8m and 3.9m separately. For more details about the parameters of the construction machinery, please refer to the PDF file. As a professional concrete mixing plant manufacturer in China, we have more than 50 years of experience in producing various agricultural machinery and construction machinery. Our wheeled tractor, concrete mixing plant, crawler excavator, and other products are all manufactured in accordance with ISO9001:2008 standard and ISO14000 standard, so you can feel secure in using them. We expect to receive your order.